Refrigeration compressors are one of the most crucial components commonly used in most modern machinery, from refrigerators to air-conditioning devices. While compressors are not generally perceived as important as other parts of a refrigeration system, the use of one type of compressor or other can result in dramatic differences in efficiency and performance. This short article will focus on reciprocating compressors, one of the many kinds of refrigeration compressors. A reciprocating compressor is a very specific type of refrigeration compressor, specifically one of the three main kinds of positive displacement compressors. 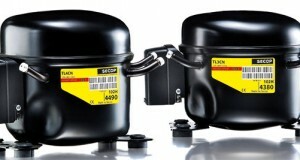 While this model is the most popular one available on the market, the fact is that it is also very easy to come across screw compressors and scroll compressors, although reciprocating compressors are found nearly everywhere, including some of the most widely used kitchen appliances, like freezers and refrigerators, for example. While screw and scroll compressors make use of rotors and rotating scrolls, respectively, reciprocating compressors employ a series of pistons to compress gas in order to increase the pressure of the system. This type of compressor is able to turn a rotational motion into a pumping motion thanks to the movement of the pistons, allowing the gas to flow around the valves located near the compression chamber. This stream of air takes place on account of the pressure differentials, allowing the device to suction, compress and discharge compressed gas in just a few motions of the pistons. One of the major advantages of reciprocating compressors is that they are able to achieve a very elevated pressure ratio, something that can provide a more efficient outcome in the medium and long term. On top of that, reciprocating compressors are also cheaper that the rest of positive displacement compressors, although, on the other hand, dynamic compressors can still be considered better alternatives for the largest refrigeration systems, still widely used by some industries. Another of the main advantages of reciprocating compressors is that require very little maintenance. This is one of the most important differences between this type of compressor and screw compressors, as the latter needs very frequent revisions in order to preserve its functionality. In contrast, a reciprocating compressor might be more expensive to repair than its counterparts, as this model was designed with a higher number of moving parts, something that can become quite a problem if a restoration is required.